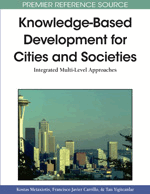 This chapter addresses the provision and condition of the knowledge-based development in the Helsinki metropolitan area, Finland. This chapter looks at linkages between regional (urban) development and welfare state elements supported by local and national policies. The authors concentrate on one hand on urban and regional policy tools, and on the other to education, because together they provide a platform for building a knowledge-based society. The authors also explore the current condition of selected creative and knowledge-intensive employment in the Helsinki metropolitan area. Creativity and knowledge-based regional and urban development have been topical issues of social scientific research for some time now. The works of Florida (2002; 2005) and others (e.g. Bathelt 2005; Cumbers et. al. 2003; Malmberg & Powell 2005; Nonaka & Takeuchi 1995; Schienstock 2004; Simmie 2001) have pointed the way recognizing the role of creativity and personal intuition in the pursuit of new economic growth. In this regard, Park (2001: 50–52) discusses knowledge intensive-industries using a scheme dividing industrial production into contexts of “intensity of knowledge inputs” and “level of technology”. He points out that knowledge-intensive companies require a highly skilled and educated labor force in order to conduct the actual research and development (R&D) that is pivotal to knowledge-intensive production. However, creativity is not the only topic in the current regional development debate. In the Nordic context, the other is the development and maintenance of a socially coherent welfare state (Esping-Andersen 1992; Heap et al. 1992; Castells & Himanen 2002). How does creative employment characterize the case of Helsinki? How does education level and system relate to these developments? What policy options have been deployed in order to support knowledge-based regional development? To take up the task of answering these questions, we present the regional context based on geographical facts and societal conditions. We use the concept of the welfare state as a societal context and Nordic reference. After contextualizing Finland and the Helsinki metropolitan area, we use statistics to provide empirical examples and evidence, including a synthesizing discussion of future trends. We conclude by addressing the main findings of our study. Finland provides a good case for examination in this study. It has been described as a Nordic welfare state in which the proportion of economic activity accounted for public sector is relatively high. The maintenance of a regionally balanced and stable welfare state is characterized by an effective transfer of resources from urban regions to peripheral areas. These transfers are used to provide welfare services, to build and maintain infrastructure and to attract regional investments.